KoehlerIndustries wrote: Does the Trufiber Venom Hood re use your factory front latch or do I have to buy one specific for the venom hood? I have read online that the bolts holding the latch on to the hood are differen't in size? Help is required!!!! Yes, The front hood latch and all the bolts to bolt the hood on is reused. I have the Trufiber hood with recessed hood pins, thats the way to go. You will have to install and bracket that the hood pins lock onto. Thank You krkitt1!! The Trufiber Hood is the best way to go!!! Does anyone have any feedback they would like to post about there venom hood? I have heard some mix reviews but alot of satisfied people over the past year about the quality of the hood!!! It is, in the end, the best hood to go with for KI3T!!! Can I get a couple ideas on how long to make the racing stripes and where to purchase them? I think there 10inch stripes but not sure. I know there smaller on the venom hood and front bumper than from the rest of the car. Just would like to get some opinions!!! In my town, they want to much for stripes!!! So if someone has a place were to get them at a good price, that would be great!!! I love my hood!! The biggest part is finding someone to do the prep and paint work on the hood. Mine was painted 3 times and then I was told thats what I get, after $800.00 These hoods take a lot of prep time so research the bodyshops first and don't just go with the lowest price. I was told between $800 and $1200, I should have gone with the guy that told me $900 because I saw a Trufiber hood he did and it was great!. I went with the 8" stripes all the way on the car, now I wish I would have done 8" on the hood and front nose and 10" on the rest of the car. I took my car to a Sign Shop and they cut the stripes out themself. Again, do your research because again, I had a problem. I first got the stripes on the whole car except the rear bumper, because I didn't have the KR bumper on at the time. When I saw that I would be going to Vegas without the KR bumper, I had them stripe it for me, Well he made a 3 inch mark on the bumper with a razor blade and then said that he didn't do it and the stripes are off a little. If you just look at the car you can't tell, but I Can!! I know every mark on my car and we got into it and he told me that he may call the cops, so I told him to go ahead so I could file a complaint on the damage he did to my car. He gave me my keys and told me to have a nice day. When I install the KR bumper, I will make the trip to Chicago to get all the stripes redone the right way. By the way the stripes cost $290. One more thing, the place that did the stripes also mess up on making the lense's for the hood 2 times!!! I hate this place!!! I did get them made and I'm very happy with them. I made the defuser's and installed them and they look great in the hood, now just waiting for the scanner to get back to install and then head out to Vegas!!!!! That's my dillema. Get the fiberglass hood and kill myself on prep work, or shell out the $1500 for the carbon fiber one. Thanks for the info krkitt1!!! The body shop in my town said about 900$. He did my spoiler, side emblems, and side stripes last year before I put the car away. He does great work and his prices are fair. I saw the pictures of your car and I agree, you should have went with 10inch stripes. Don t feel bad though, I have to re-do my side stripes because they were done in grey instead of the matte black and didn t realize it until they were on the car! lphill01 wrote: That's my dillema. Get the fiberglass hood and kill myself on prep work, or shell out the $1500 for the carbon fiber one. 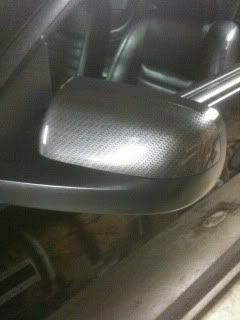 I went with the fiberglass and it looks awesome!!! When its done and on the car, I will let you know my opinion. My body shop said it needs some TLC, But I have confidence in them. I know not all shops are the same though. Its a gamble I ve read but no one here has anything bad so far to say about the hood! I have also read the 3rd generation of the venom hood is better that the first run when they came out. I may have the second generation hood, the inside opening of the hood is smaller than Matt's from what me and Taoworm can see. 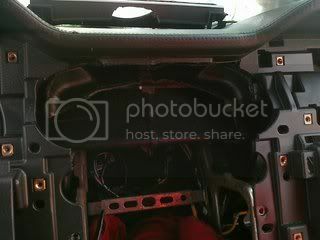 does anybody have step by step orb install pics as well as an exploded view of the dash??? 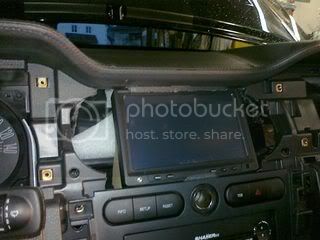 I have asked all of my customers to not take pictures of the dash install and to never post them publicly. Don't worry though, the Orb comes with directions and PDFs on the dash. Yes, the Orb comes with directions and PDFs on the dash. Also if you need help, Taoworm is great at helping you out. Wow, That came out strange, It's a video of the new Pypes Pype Bomb Muffler deletes. Also, the first time my wife has ever started my car. Sounds great! A little throatier, with a deeper tone than mine. KARR lives! (At least partially.) Here's a mock up of my scanner sitting on my stock hood. Well in a post from a year ago, here is the link, viewtopic.php?p=189663 the nice gentleman from Germany posted the pictures that I think Pierre is looking for, so I am not sure when you started your customer picture ban, especially since you comment on the post how great his install looks, but in the spirit of helping out Pierre, and since these were posted publicly on this site, here are the pictures I think Pierre was looking for. 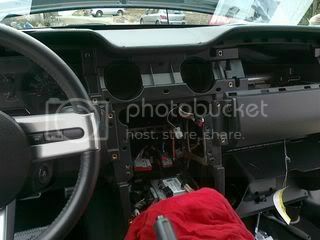 My opinion, is that itlooks like a whole lotta cutting up of a Mustang dash for one little 7 inch flatscreen television, plus it would be kinda hard to undo that if you decide to sell it in the future. Also, what happens with the vents being blocked with all that? I bet that if you run the cooling, and it has no where to go that you will frost up your speedo gauges, possibly causing more damage to your car, but again, these observations are just my opinion. To me, it does not look like the screen car orb from the show but that it up to each individual to decide I guess, as you can trade screen accurate for some flashing lights, and hopeful voice response, when it chooses to work, plus the added cost of a car computer too, ouch, or go another way to get the exact look you want for your replica. yes it helped but what is the material behind the orb assemblie look like some aluminium thing and where does the micro for speaking come? I would send a PM to Radioman from the author of the topic I linked you too in my thread, I am sure he can answer these questions. Maybe he got taken out for posting forbidden pictures of KI3K's functions, and their installation by Dr. Graiman or maybe a FLAG elite hit squad. Pierre, don't listen to "Kitt2k" AKA John. He is the only customer I ever had that I had to put on a ban list. 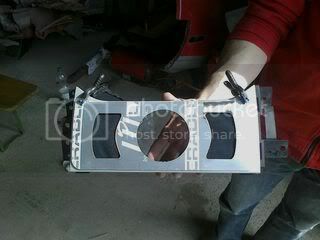 The very minimum is cut out for the instillation. The screen fits PERFECTLY into the space provided. The screen is also the correct size for the voice Orb to look and work right. 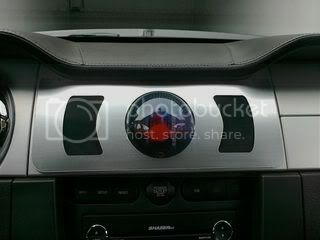 How would you install a screen, stick it on the dash with tape? 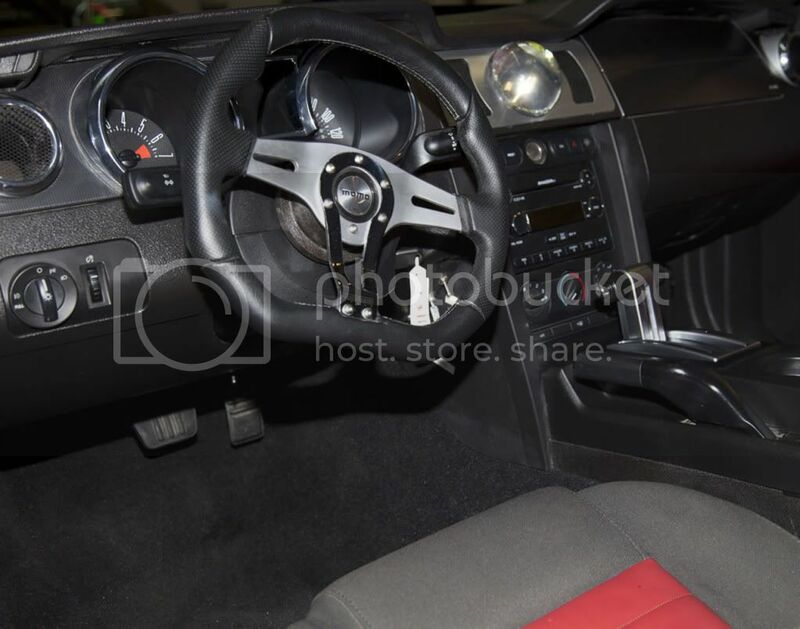 OF COURSE you have to cut into the dash to accommodate the Orb. They had to do that on the show cars too. kitt2k wrote: plus it would be kinda hard to undo that if you decide to sell it in the future. Why would you "undo it" if you sold it in the future? If anyone sold there replica in the future they would sell it as a Knight Rider car not a Mustang. That's like saying "if you want to sell your K2000 Tran-AM in the future you better think about installing that K2000 dash if you want to sell your Trans-AM later on." That makes NO sense. 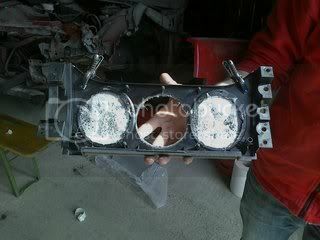 kitt2k wrote: I guess, as you can trade screen accurate for some flashing lights, and hopeful voice response, when it chooses to work, plus the added cost of a car computer too, ouch, or go another way to get the exact look you want for your replica. John you need to lay off the hate, you look foolish because your R E A C H I N G for reasons to tell folks to not buy from me...it's getting old.